UVB-76 is a radio transmitter currently located near Pskov, Russia. The transmitter operates at 4625 kHz, continually emitting a burst of buzzing tones. Periodically the station will transmit voice messages instead of the usual buzzing tones. This has gone on, almost uninterrupted, since sometime around the late 1970s or early 1980s. Common belief is that the station's affiliation is with the Russian military. While unconfirmed, this believe is lent some credence based on the station's moving from its original site in Povarovo to the current site in Pskov at the same time Russia's military went through a reorganization. The Russian government has never made an official statement on UVB-76's purpose. Another widely held belief is that UVB-76's frequent buzzing is a placeholder, or channel marker, keeping the frequency in use in order to prevent it from being used by another entity. The buzzing sound also makes it easy to identify that the transmitter is functioning properly, a lack of buzzing would indicate transmission has ceased. The voice transmissions that occasionally interrupt the usual buzzing cause experts to label UVB-76 as a numbers station; a station used to transmit encrypted messages across the airwaves. Some have posited the theory that the station is part of Russia's Dead Hand nuclear control system, believed still to be maintained and ready for use today in post-Soviet Russia. The system's design allowed the launch of then-Soviet nuclear missiles, as retaliation, in the event an attack eliminated all Soviet leadership before being able to issue an official counter strike order. The most notable transmission occurred on November 3, 2001 when a microphone was unintentionally left open, allowing an unintended conversation out onto the airwaves. Translated to English, the conversation states "I am 143. Do not get a generator." "There is such a work of hardware." An alternate translation is “I am 143. Not receiving the generator.” “That stuff comes from hardware room.” On November 11, 2010 a 30 minute phone conversation was accidentally transmitted. In April of 2011 more unplanned voice transmissions occurred. Since these incidents, the station has returned to its normal operations of frequent buzzing and occasional planned voice transmittals. 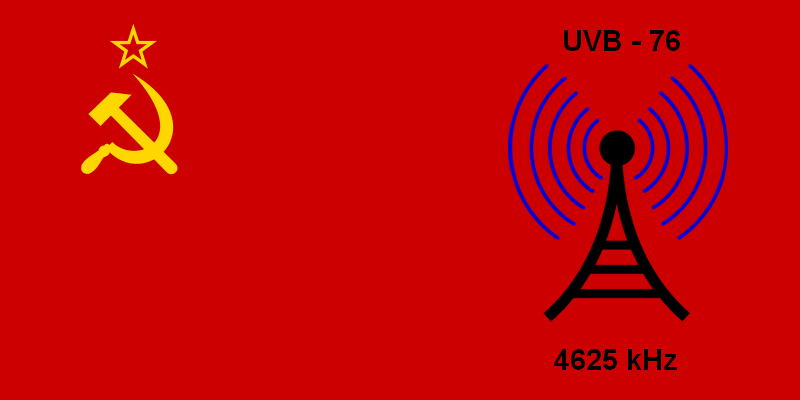 UVB-76's fan base has grown, as the signal is now available to anyone, worldwide, via an internet repeater. Aficionados of the signal date to the early 80s, meaning its following stretches back almost as long as the transmitter's existence. In all likelihood, UVB-76 exists as part of the Russian military's back up communications channel. Alternatively, perhaps the station is a cold war relic kept alive and ready if bleak times descend on Mother Russia once more.